New book reveals a father's deep love for his children and his desire to stay connected with them while at war. Author, Larry Michalove announces the availability of his new book, "The Four Little Children." The compilation of short stories in "The Four Little Children" is the result of Larry Michalove's deep love for his children and his desire to stay connected with them while he was away at war. In November 1970 Larry Michalove received a navigational assignment to the 16th Special Operations Squadron (AC-130 gunships) flying night combat missions out of Ubon, Thailand. Their mission would be to stop trucks infiltrating South Vietnam via the Ho Chi Minh Trail. Like most fathers, Michalove was in the habit of telling stories to his children before they went to sleep at night and wanted to maintain this connection to them. During his tour of duty, he wrote almost daily letters to his wife and periodically included a story that she could read to their four little children. Michalove made his children the central characters of these stories, in which an elf-like character took them on wonderful and exciting adventures. Michalove's wife, Sybil, saved all of his letters. In 1986, both Michalove and his wife had enough fresh perspective to revisit the letters, and remembering the wonderful tales to the children in each one, compiled the stories into a green book for each of their four children as a keepsake. In May 2004, one of his granddaughters in Atlanta, GA asked her mother to read the stories to her kindergarten class. "Grandpa" Larry was invited over to read the final two chapters of his storybook. The teacher was so enthralled with the stories that she encouraged him to publish them so that others could also enjoy and benefit. 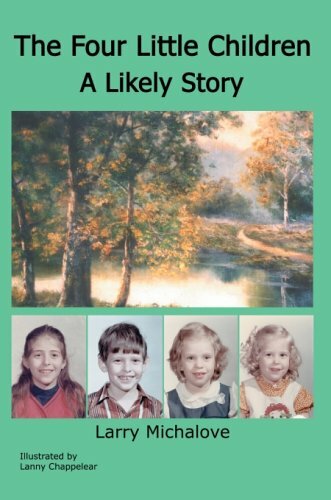 "The Four Little Children Â A Likely Story" is published by iUniverse and available through Amazon.com, Barnes & Noble.com and most retail outlets nationwide. "He didn't write about the war or the 114 combat missions he flew, earning him the Distinguished Flying Cross and eight air medals. Instead he wove tales about Martians and moon people and mermaids and the sea." "Larry Michalove's story deserves a postscript Â about how kids all over America are clamoring for his book." Larry Michalove was born in 1933 in Asheville, NC. He is a 1955 graduate of the United States Military Academy and later received an MS degree from Stanford University. He resides in Birmingham, AL with his wife of 45 years, Sybil. They have four children and nine grandchildren. "The Four Little Children: A Likely Story"